De novo calling: Zam Iqbal suggested using his cortex_var de novo variant caller in addition to the current GATK, FreeBayes and samtools callers. With his help, we’ve included these calls in this release, and provide comparisons between de novo and alignment based methods. Improved variant classification: Consolidating variant calls from multiple callers involves making tough choices about when to include or exclude variants. I’ll describe the details of selecting metrics for use in SVM classification and filtering of variants. Our goal is to iteratively improve our calling and variant preparation to create the best possible set of reference calls. I’d be happy to talk more with anyone working on similar problems or with insight into useful ways to improve our current callsets. We have a Get Satisfaction site for discussion and feedback, and have offered a $2500 prize for helpful comments. The variant analysis infrastructure, built on top of GATK, automates genome preparation, normalization and comparison. It provides a full pipeline, driven by simple configuration files, for consolidating multiple variant calls. The combined variant calls, including training data and potential true and false positives, are available from GenomeSpace: Public/chapmanb/xprize/NA19239-v0_2. The individual variant calls for each technology and calling method are also available from GenomeSpace: Public/EdgeBio/PublicData/Release1. de novo variant calling performs reference-free assembly of either local or global genome regions, then subsequently uses these assemblies to call variants relative to a known reference. The advantage is that assemblies can avoid errors associated with mapping to the reference, helping resolve large variations as well as small variations near problem alignments or low complexity regions. 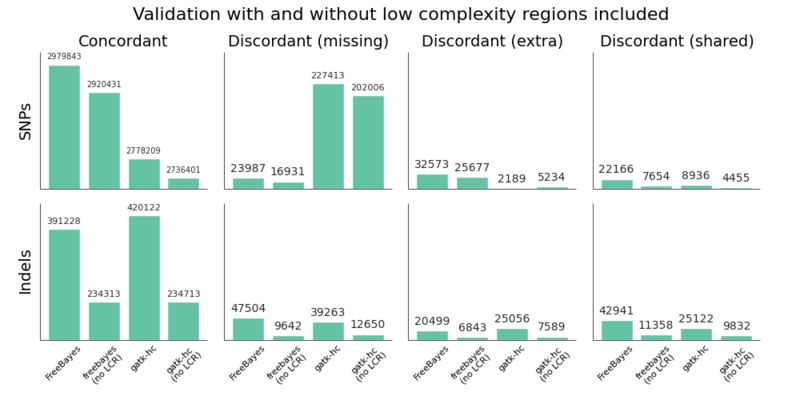 Hybrid approaches that use localized de novo assembly in variant regions help mitigate the extensive computational requirements associated with whole-genome assembly. 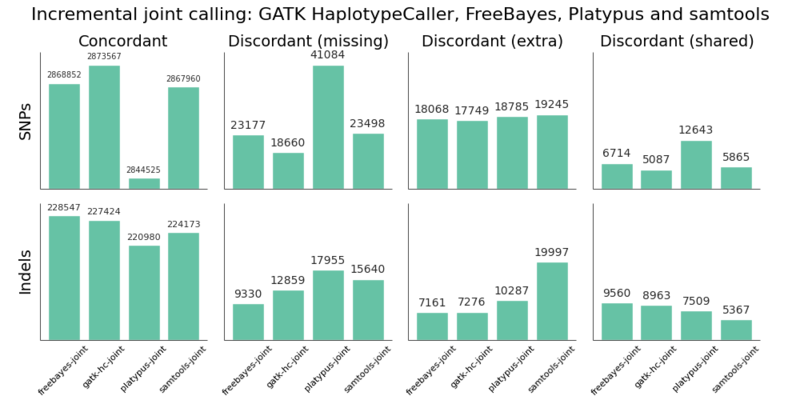 Complete Genomics variant calling and GATK 2.0’s Haplotype Caller both provide pipelines for hybrid de novo assembly in variant detection. The fermi and SGA assemblers are also used in variant calling, although the paths from assembly to variants are not as automated. Start with reads aligned to fosmid regions using novoalign. For each fosmid region, extract all mapped reads along with a local reference genome for variant calling. de novo assemble all reads in the fosmid region and call variants against the local reference genome using cortex_var’s Bubble Caller. 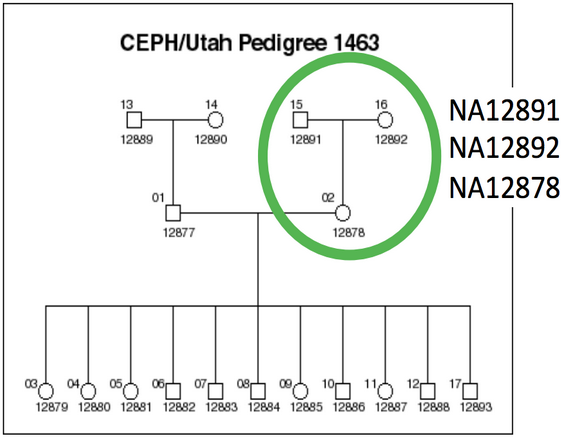 Remap regional variant coordinates back to the full genome. Combine all regional calls into the final set of cortex_var calls. 11% of the GATK calls and 14% of the cortex_var calls are discordant. The one area where cortex_var does especially well is on indels: 19% of the cortex_var indels do not agree with GATK, in comparison with 37% of the GATK calls and 25% of the samtools calls. The current downside to this is SNP calling, where cortex_var has 3 times more discordant calls than GATK. 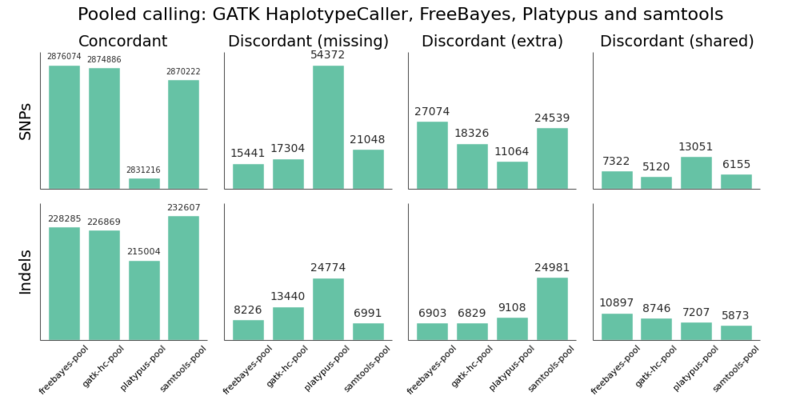 Overlapping variant calls from different calling methods (GATK, FreeBayes, samtools and cortex_var) and sequencing technologies (Illumina, SOLiD and IonTorrent) produces 170,286 potential calls in the fosmid regions. 58% (99,227) of these are present in all callers and technologies, so we need to do better than the intersection in creating a consolidated callset. As detailed in the previous post, we filter the full set in two ways. The first is to keep trusted variants based on their presence in a defined number of technologies or callers. We currently have an inclusive set of criteria: keep variants present in either 4 out of the 7 callsets, 2 distinct technologies, or 3 distinct callers. This creates a trusted set containing 95% (162,202) of the variants. Longer term the goal is to reduce the trusted count and rely on automated filtering approaches based on input metrics. This second automated filtering step uses a support vector machine (SVM) to evaluate the remaining variants. We train the SVM on potential true positives from variants that overlap in all callers and technologies, and potential false positives found uniquely in one single caller. The challenge is to find useful metrics associated with these training variants that will help provide discrimination. 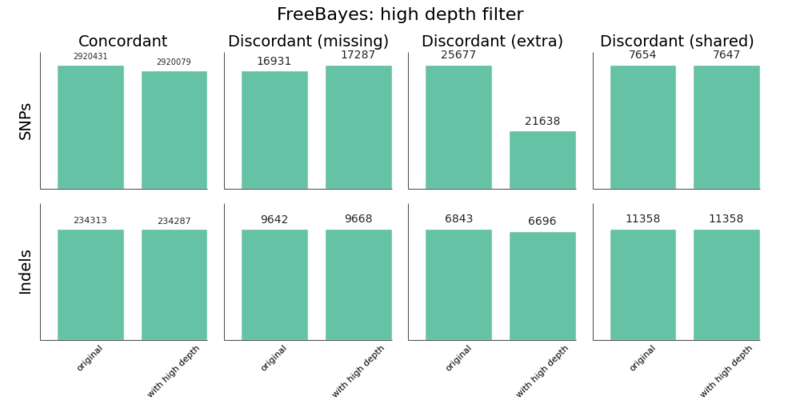 In version 0.1 we filtered with a vanilla set of metrics: depth and variant quality score. To identify additional metrics, we used a great variant visualization tool developed by Keming Labs alongside HSPH and EdgeBio. I’ll write up more details about the tool once we have a demonstration website but the code is already available on GitHub. To assess the influence of adding de novo calls and additional filtering metrics on the resulting call set, we compare against whole genome Illumina and Complete Genomics calls for NA19239. Previously we’d noticed two major issues during this comparison: a high percentage of discordant indel calls and a technology bias signaled by better concordance with Illumina than Complete. The comparison between fosmid and Illumina data shows a substantial improvement in the indel bias. Previously 46% of the total indel calls were discordant, indicative of a potential false positive problem. With de novo calls and improved filtering, we’ve lowered this to only 10% of the total calls. These comparisons provide some nice confirmation that we’re moving in the right direction on filtering. As before, we extract potential false positives and false negatives to continue to refine the calls: potential false positives are those called in the fosmid dataset and in neither of the Illumina or Complete Genomics sets. Potential false negatives are calls that both Illumina and Complete agree on that the fosmid calls lack. In the new callsets, there are 5,499 (3.5%) potential false positives and 1,422 (0.9%) potential false negatives. We’ve reduced potential false positives in the previous set from 10% with a slight increase in false negatives. These subsets are available along with the full callset on GenomeSpace. We’re also working hard on an NA12878 callset with equivalent approaches and will make that available soon for community feedback. I hope this discussion, open source code, and dataset release is useful to everyone working on problems of improving variant calling accuracy and filtering. I welcome feedback on calling, consolidation methods, interesting metrics to explore, machine learning or any of the other topics discussed here.